Waves crash over the sand spreading its lacy chalky white foam all over the beach. The beach is calm and serene against the gentle water of the sea. The beach leads to the national park surrounded by trees in surprisingly different shades. The sunlight in the park shines on the beauty of the worldly environment. Welcome to paradise, the Cahuita National Park. 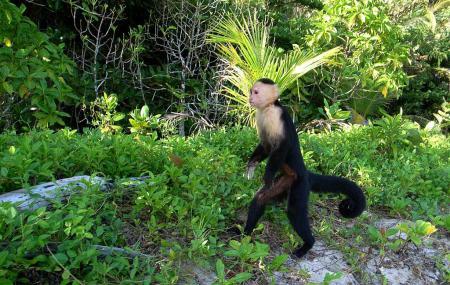 Cahuita National Park was created in 1970 as a site and reformed as National Park in 1978. It is also the only park which does not charge an entrance fee and instead accepts donations. The name Cahuita is from the native language which means CAWI, mahogany, a tree of the region and TA is the tip or point. Cahuita is a swamp land located in the depression that lies between the coral platform and the mainland. Cahuita National Park’s aim is to preserve the beaches and lowlands and the marine life which contains Coralline reefs, a nesting ground for sea turtles. It is home to a variety of birds, the Green Ibis, Green rufous Kingfisher and Keel billed Toucan. The Mantled Howlers, White headed Capuchins, White nosed Coatis, Raccoons, Sloths, and all live in harmony in this 600 acre reef. The quivering water is teeming with abundant life of 35 species of coral, 140 species of molluscs, 44 species of crustaceans, and 123 species of fish. Tourists can snorkel and scuba dive in the pristine water. The water unfolds a world of mystery. Sea fans, angelfish, blue parrot fish, urchins, barracudas and stingrays swim by. If this does not stun your attention then check the sunken ships, a ship which transported slaves and sank in the 18th century. The park is close to the town of Cahuita so the roads and facilities are well developed. Roads from the north and the south lead to the park. It can also be reached on foot through Kelly Creek, which is south of Cahuita. Hiking tour in the park is available with a bilingual guide and this includes an entrance fee. Food and drinks are not available on the tour. Wear light clothing, carry sun block, towel, water, swimsuit, and sport sandals. Make a reservation with all personal details and payment is required for this service. An e-voucher will be sent which you should carry to start the tour. During the rainy season the paths get muddy so hiking can be tricky. Snorkelling equipment is available on rent and you can rent a boat and guide as well. Check with rangers for the safest and clearest areas for snorkelling. 750 Cahuita Express daily from San Jose to Cahuita. Auto Transporters is another mode of transport. How popular is Cahuita National Park? People normally club together Pizzeria Cahuita and Playa Blanca while planning their visit to Cahuita National Park. People also prefer to start their day with Cahuita National Park. Best sightings of just so many animals, better than our Amazon walk in Brazil to be honest in that respect. Sloths, tree climbing iguanas, large monkeys, raccoons, even a viper. Great guide pointing everything out to us. This place is lovely, the beach is great a the little town too. You are not supposed to bring drinks into this national Park. But you can manage to disguise them.